To preserve the natural beauty of our lake and the surrounding area. CLAPA performs periodic water quality testing. We maintain sanitary facilities at the public launch on County Road. Most importantly, we track and remove invasive species that threaten the lake. We are a member-supported organization. Please consider joining or reinstating your membership. This year as in years past our focus is on reducing the spread of the exotic weed called variable milfoil that has infested our lake. See below for more information of what variable milfoil is and how you can help in containing and stopping the spread of this infestation! Although the State of New Hampshire actually owns the lake, maintenance of the lake falls upon local efforts. 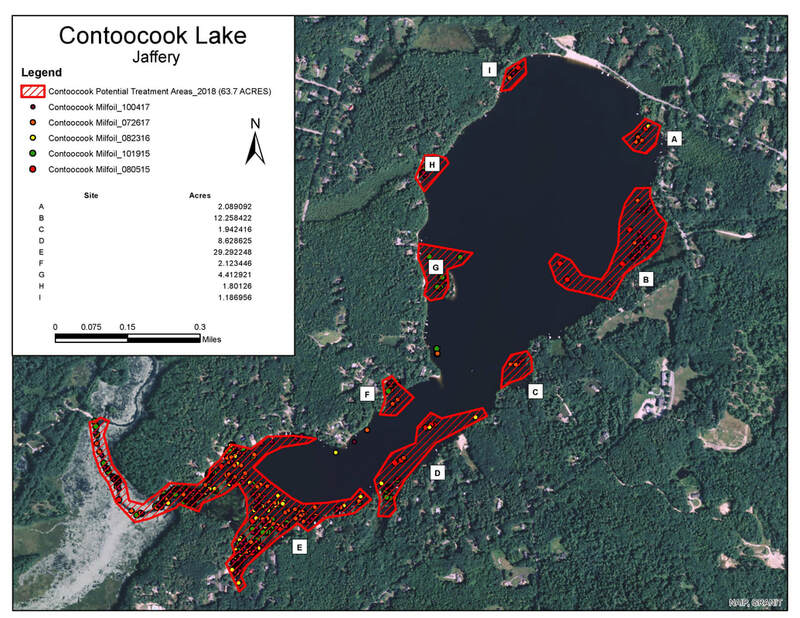 For Contoocook Lake, CLAPA is the recognized agent. Although we have dedicated volunteers to assist our efforts, we have to pay professionals for services to maintain the lake quality. For the 2018 season, the State of New Hampshire is reimbursing 30% of our invasive weed control efforts up to a total of $7,500. It is our responsibility as property owners and CLAPA members to maintain our lakes beauty and our investments. Please consider volunteering for one of our many programs that will ensure the beauty of our lake for many years to come. 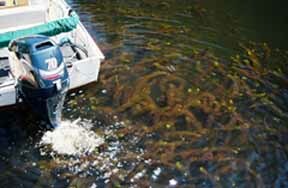 This coming summer(2018) the Board of Directors for CLAPA has approved the use of Chemicals as well as divers to fight the ongoing issue of Milfoil growth in Lake Contoocook. This position has also been requested by Amy Smagula of the NH DES. Consequently, we will initiate a chemical treatment program in August using an EPA approved aquatic herbicide, ProcellaCOR. This liquid herbicide has a reduced risk assessment from the US EPA and will provide a safe systemic control of Milfoil in our lake. Hand removal can only be done by specially certified SCUBA divers. They are trained in carefully extracting the plant, together with the root ball, without breaking the plant into fragment that can reroot as new problems. The majority of our weed removal is taking place on Mondays and Fridays this summer, using two paid contract divers and one CLAPA volunteer diver. We desperately need boat pilots who can haul the bags of weed onto a pontoon boat and empty them into buckets for disposal. We have an electric winch to raise the bags but it can be a muddy job. We need volunteers who are comfortable in a kayak, canoe, or rowboat, who can assist the divers by moving the collected weed to the collection boat, supplying new collection bags to the divers, scooping up fragments that inevitably form, and monitoring the safety of the divers. Weed watching. If you see milfoil, please mark it. Markers are available at Ted Covert's and Jim Grier's docks. If you are a certified Open Water diver, CLAPA will pay the cost of the certification for Weed Control. Go here to sign up to volunteer! A member of our board will be in touch with you to personally to get you started on how you can help! Thank you! Yearly membership dues for 2018 are $55 and are now due. We appreciate your support. Thank you in advance for supporting CLAPA and taking an interest in your lake! Bring your membership dues to the Annual Meetings, Saturday June 16th 930 am social, 10am meeting. Saturday August 18th 930am social 10am meeting. Mail it to CLAPA, PO Box 125, Jaffrey, NH 03452. Because we are a member-supported organization any additional moneys we receive over and above membership dues go directly to maintaining and supporting the cleanup activities for your lake. Please consider an additional contribution along with your yearly membership dues. Any amount no matter how small will be greatly appreciated. All contributions are tax deductible. Our lake has an infestation of the exotic weed called variable milfoil. Want to know how you can help contain and stop the spread of this infestation? Attend one of our yearly meetings or click this link to be directed to our contact page. A CLAPA board member will be back in touch with you shortly! Thank you for your interest. 'Like' us on Facebook or contact us by clicking one of the above icons. Copyright © 2017 Contoocook Lake Area Preservation Association (CLAPA). All rights reserved.